MAX is a fully automated, totally integrated parking unit accommodating a variable number of vehicles in a high-density, compact area. 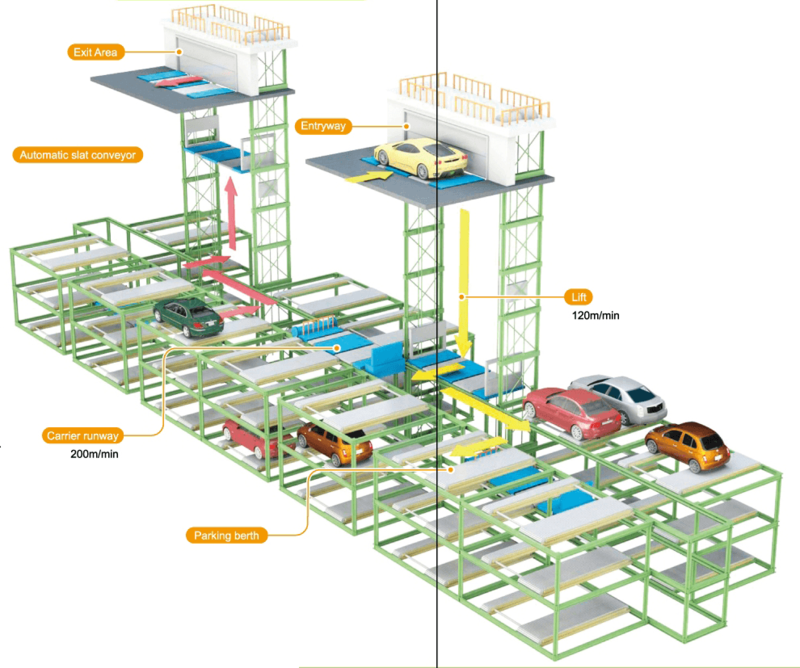 Units can be combined both vertically and horizontally to create a computer-controlled parking garage of any scale required. When used in underground applications, MAX parking garages can make an especially important contribution to the preservation and enhancement of the urban landscape. 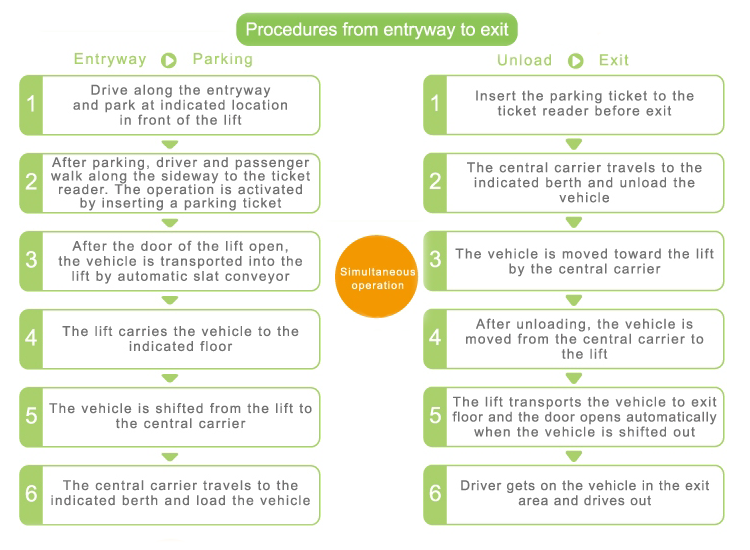 Once users disembark from the vehicles, all operations are computer-controlled. Automation both assures users safety and collision-free handling. In-coming vehicles are automatically aligned to ensure collision-free handling and optimum efficiency in space utilization. Also, the front guide mirror and indicating light facilitate easy parking. 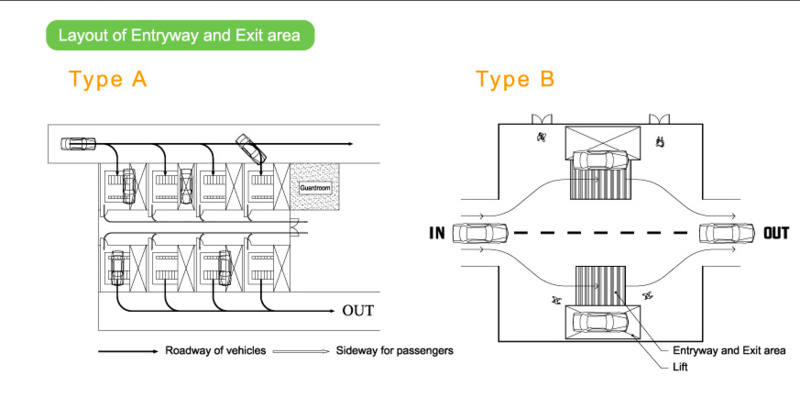 Each MAX unit consists of an entryway where the driver and passengers align, a lift expressly for in-coming vehicles, two rows of parking berths separated by a carrier runway, a lift for exiting vehicles, and an exit area where the driver and passengers re-board. For optimum speed and efficiency, in-coming and exiting operations can take place simultaneously. Overall operating efficiency is dramatically boosted through the adoption of slat type conveyors to replace conventional Pallets. Time normally required to handle empty pallets is eliminated, and no space is needed to store unused pallets. 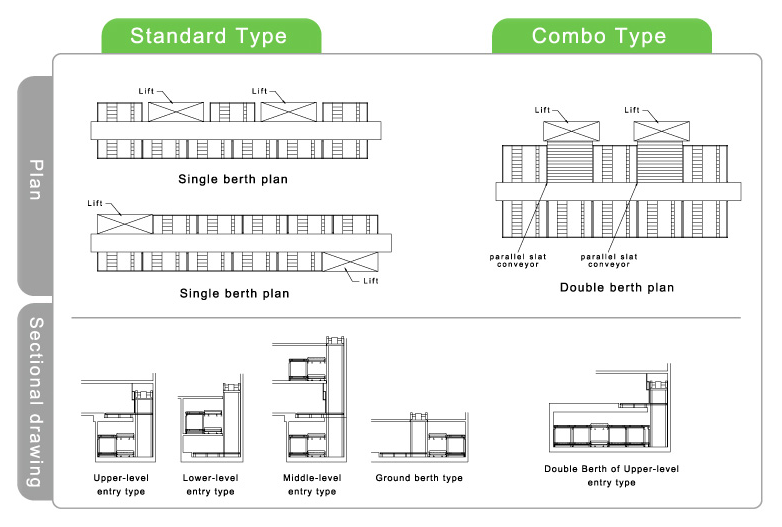 MAX units can be used individually, or they can be combined both horizontally and vertically in any number required to accommodate up to thousands of vehicles. Entry and exit lifts can also be located at random. 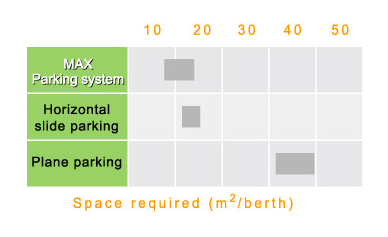 Compared with conventional parking equipments, MAX consumes low energy since there is no need to exchange pallets. It is also remarkably friendly to the environment, since vehicle engines are turned off on the premises. Various units of lifts and automatic slat conveyors operate individually and simultaneously, which achieve high efficiency. 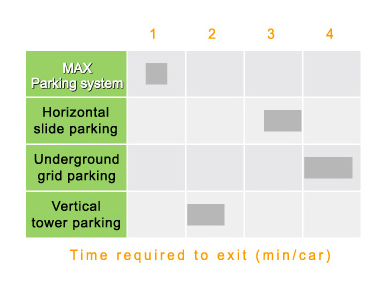 The automated control enables vehicles to reach their parking berth or the exit area in as little as 38 seconds on the average in continuous sequence, about two-thirds less than the time it takes in conventional mechanical parking garages. With MAX units, overall space requirements can be reduced by up to two-thirds compared with conventional self-park type garages. An especially noticeable cutback is achieved in vertical height because drivers and passengers do not enter the parking area.